For the mighty grizzly bear, like all wildlife, habitat is crucial. 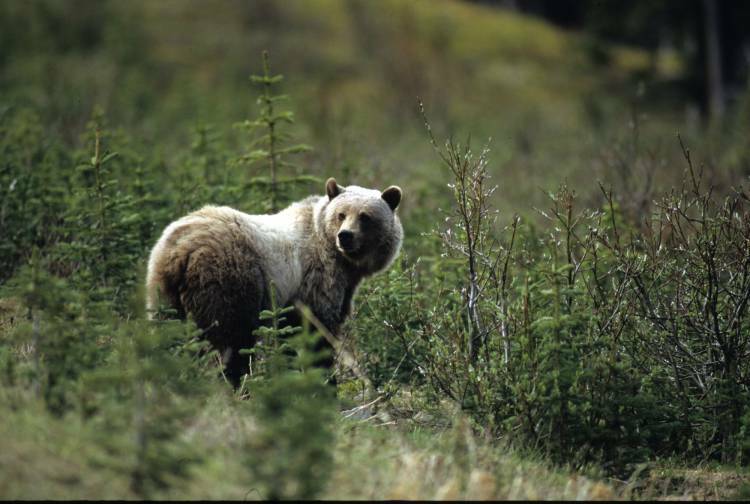 But for grizzly populations to thrive in the long term, connectivity is just as important. Along the Rocky Mountains, changes in connectivity and habitat have seen grizzlies thrive in some places and sent populations into a nose dive elsewhere. In the southeast corner of BC, the Elk and Flathead Valleys tell a story of habitat and connectivity that just might break your heart. But it’s a story we still have a chance to change. If we listen to biologists working here, in the Crown of the Continent, we can strengthen the dangerously frayed link that connects grizzlies along the Rocky Mountains, all the way from Yellowstone National Park to Canada’s North. Grizzly bears travel far and wide in search of food and mates. While males have home ranges of one or two thousand square kilometres, younger male grizzlies heading out into the world have been known to travel hundreds of kilometres from home, helping to spread genetic diversity across the continental landscape. BC’s Flathead, a valley without human settlement or mines, is a great place to be a grizzly—and grizzlies are thriving there. But just over the ridge, the narrow Elk Valley is a perilous place to be a bear. Highway 3 and the Canadian Pacific rail line are dangerous crossings for bears travelling north or south. Even worse, towns and farms draw bears in with the promise of food from trash, roadkill and fruit—and bears lose their lives when they get too used to our food and stick around a little too long for everyone’s safety. But the story only gets worse: Clayton Lamb, a grizzly bear biologist who has been working in the area for years, recently discovered that the Elk Valley is an ecological trap for grizzlies. Bears from the Flathead to the south and from the wilds of parks and backcountry areas to the north wander into the Elk Valley. There, they find a grizzly bear dream—plentiful huckleberries and buffalo berries, not just because of the natural fertility of the valley, but also because logging and forest fires have left large open areas that are perfect for bumper berry crops, not to mention all of the human-related food sources. The Elk Valley is a trap, baited with good berry crops, but ultimately leading bears to an early death. Grizzlies, who sat on top of the food chain until humans came along, have no natural predators. Their evolution didn’t shape them to avoid danger, so they fall victim to road, rail and humans far too often. Clayton’s research shows the heartbreaking consequences: Forty bears travelled into the Elk Valley over his nine-year study and ended up dying there, but only four moved out permanently to live out their lives elsewhere. Clayton estimates that more than a hundred bears died in the valley, a human-caused mortality rate three times higher than in valleys to the north and south! More than half of those bears lost their lives on the rails or the highway. For the broader grizzly bear population, the result is a crucial connectivity link almost entirely severed. Bears from the north or south of the valley rarely make it permanently across to the other side—and that puts the whole population in danger. While parks and other safe habitat for bears, like the Flathead, are important, if these islands of safe habitat aren’t connected, the long-term story for bears will be a sad one. But it’s not too late! We can do better to keep bears safe in the Elk Valley—and we don’t have to look far to see how. In the Banff parks complex, wildlife fencing and highway crossings have been keeping bears safe for years. The railway through the park is still dangerous, but CP has made progress by reducing grain spills and otherwise keeping bears off the tracks. And within towns, bear aware ways of handling garbage and other food sources make a real difference. But we can only do so much with road, rail and towns. The Elk Valley is heavily logged, has more than a hundred square kilometres of open pit coal mines and is covered with backcountry roads and trails that are heavily used by tourists and locals for recreation. It’s time to give some of the Elk Valley landscape back to the bears and other wildlife, by reclaiming roads for nature, giving bears space away from humans and their noisy recreation, leaving more intact forest and making sure we don’t allow more coal mines to turn large areas into moonscapes. We’ve created an ecological trap in the Elk Valley. But we can change the story. We can work to make the valley safer for grizzlies, so they can roam along the Rocky Mountains, connecting a bear population across the continent.